TimingExplorer offers a set of parameterizable ECU core models to explore the effects of different ECUs or different ECU configurations on the worst-case execution time performance. This allows designers to account for timing and timing effects in an early design phase and helps avoid late-stage integration problems. Choosing a suitable processor configuration at the beginning of the development is a challenge. A configuration that is too powerful can lead to a waste of expensive resources. A configuration not powerful enough might entail changes late in the development cycle and delay the delivery. TimingExplorer offers a set of basic ECU core models representative for different performance classes. Cache architecture and memory map are fully parameterizable. 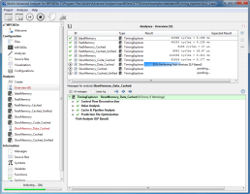 TimingExplorer requires representative source code of representative application parts, e.g. from previous releases or rapid-prototyping defelopment environments. The source code is compiled by a standard compiler and its timing behavior is determined using AbsInt’s award-winning aiT timing analysis technology. 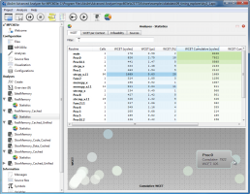 TimingExplorer can also be combined with other analysis tools from AbsInt (for example, StackAnalyzer for stack usage analysis) in a single intuitive user interface.